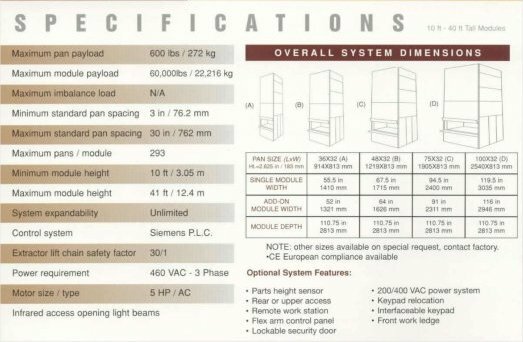 This unique vertical lift storage system stores different sized parts. Modular in design, the Industriever Vertical Lift Storage System moves only the required pallet to the operator, not the entire payload, eliminating the problem of load imbalance. Adjustable shelves from 3" to 31" maximize use of cubic space. 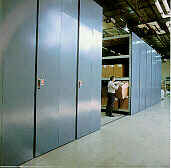 Shelves sizes up to 100" X 32"
Can be linked with other automated storage & retrieval equipment. Average access time 20 seconds with 3-module system. 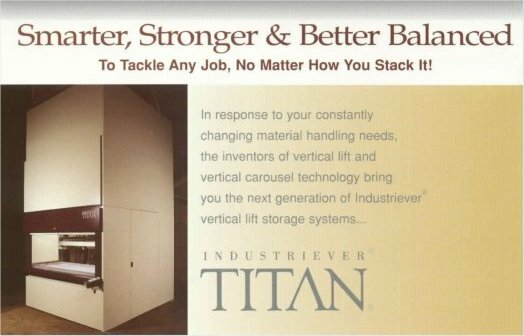 The Industriever Vertical Carousel Storage and Retrieval Systems maximize small parts handling and materials control. Efficient, they increase productivity and save valuable floor space. The Industriever Vertical Carousel Storage system units are ideal for small parts assembly lines, warehousing, inventory storage, and work-in-process. Heights up to 24' utilize vertical air space. Loads up to 600 lbs. per carrier. 3.3" to 13.8" storage clearance. Various carrier styles available to meet customer needs. Increases productivity up to 125% in high pick-and-put situations. Kompakt Movable Shelving storage systems accommodate various sizes of materials. Available in a mechanical assist or electronically controlled system, Kompakt offers economical high density hand loaded storage. It's easy to operate, saves space, and allows centralization of various small parts. Accepts any type of new or existing shelving. Unit heights up to 12 feet. Entire system locks for security. Multiple aisle feature permits simultaneous access by more than one operator. 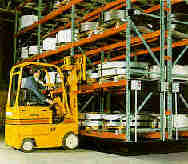 The Movable Rack System lets you make the most of one of your company's biggest investments -- floor space. With racks mounted on movable carriages, the system creates access aisles -- for people and fork trucks -- only when and where they're needed. So aisles not in immediate use aren't taking up valuable floor space that could be devoted to revenue-producing activity. All wheels are driven by a full-length drive shaft for smoother operation. Exclusive safety bypass permits safe, uninterrupted operation without costly down-time. Warning horn sounds 3 seconds before range movement begins and continues intermittently throughout movement. Warning light on every range signals movement of any range. Photoelectric sensor slows range movement as aisle closes; no bumper arm projecting in aisle. Optional. From simple part locator program to fully integrated inventory management system. Choose from these features . . .